We were recently invited to an Arabian Night filled with great food, belly dancing and live music. The mezze platter for one came with hummus, baba ghanuj, tabbouleh, falafel, beetroot labne, cheese samboussek, flatbread & pickles. These all came on a massive plate and we loved absolutely everything on it, especially the beetroot labne and the tabbouleh. The Halloumi cheese & zaatar man'ousha flat bread was an oven-baked flat bread with halloumi cheese, wild thyme and fresh mint. This was super warming and comforting (carb heaven) but was a strategical mistake because we felt super full after the starters. Despite this, we powered on and got our mains. The mixed grill, a selection of lamb kofta, chicken kofta and chicken taouk, was the highlight of the meal. The skewers of meat each came with a different seasoning and there were so many flavours going on in the dish. We really loved it. It was exotic, original, and a must. The aubergine fattet was a dish of slow-cooked aubergines, tomatoes, pepper & onion moussaka warm tahina, with a warm tahina yoghurt sauce, crispy onions & toasted flatbread. To be honest, this was nice but way too heavy for us. It was hard to tell the different flavours apart and really enjoy them, and the whole dish was covered by too much yoghurt sauce. We were a little bit disappointed by this one but it's still a great dish, it's just that compared to the other (amazing) ones, it wasn't as good. After the starters and mains we were way too full for desserts, although the baklava collection looked fab. The atmosphere was amazing. We absolutely loved it. The live dancers were mesmerising and were really engaged with the public. Many people stood up to dance with them and the staff got involved too. Thanks Comptoir Libanais! We will be back soon. 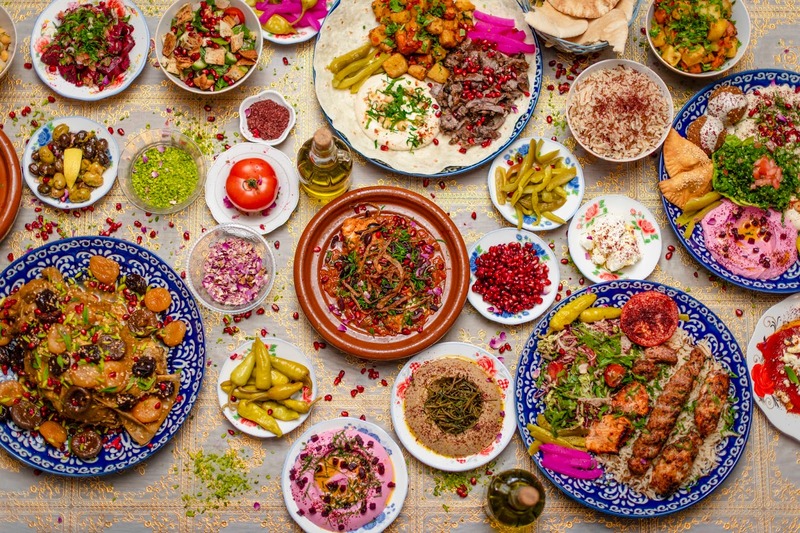 Disclaimer: Bath Eats was invited to a complimentary meal at Comptoir Libanais in return for an honest review to be posted on our social media channels. All thoughts and opinions expressed herein are my own and not influenced by the company, and/or its affiliates in any way.